Join us for a webinar on September 22 at 2:00 p.m. ET for an exclusive industry webinar! If the recent recession has taught companies anything, it's that they need to make better use of their IT resources. So it's no wonder that more companies are taking a hard look at shared services to consolidate systems, reduce operations costs and increase visibility into the information that flows through their operations. One example is Allstate, which has deployed a shared services center for its document scanning. During this case study presentation, Allstate will share the challenges it faced with decentralized scanning; key elements of its business case for centralizing scanning; the benefits it has achieved; and how the lessons it learned can be applied by any size company, in any vertical. 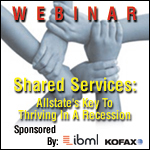 Join us for a webinar on September 22 at 2:00 p.m. ET! Allstate will share the challenges faced with decentralized scanning, key elements of the business case for centralizing scanning, the benefits achieved, and how the lessons learned can be applied by any size company, in any vertical.